I'll bet you never thought these ol' pins could waddle that fast did you? I wasn't planning this post, at least not today, but about an hour ago I came across my note with a challenge I HAD to play in and the time is almost up. It was very important from me to join in the Tag You're It challenge so I could DJKASE one of my favorite card artists. 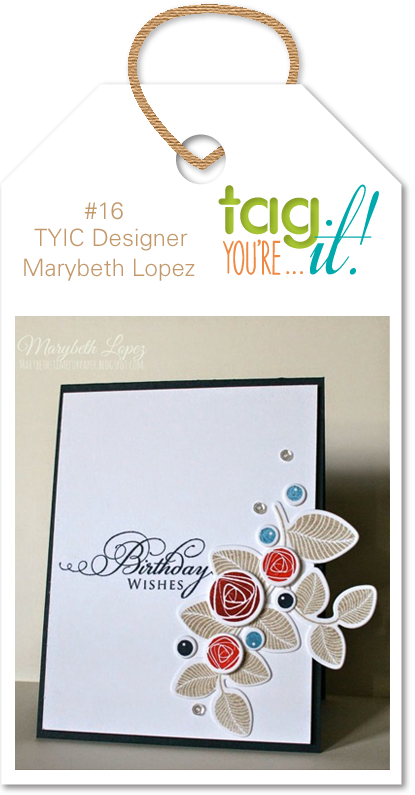 She is Marybeth Lopez and her delightful blog is Marybeth's Time for Paper. If you aren't familiar with Marybeth, you are in for a treat! She has never made a card or a tag that I haven't fallen in love with! Aren't they stunning? I'm especially biased about the card you see because I was privileged to receive that card from Marybeth for my birthday last July. It is even more gorgeous in real life! Now it is my turn to honor Marybeth by making a "Marybeth" DJKASE for this challenge. 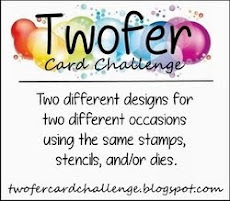 My colors are different because I like to be a bit different with a DJKASE, so I used the color choices from the MFT Card Challenges: Color Challenge, which is also about to close! The papers used in my tag are PTI kraft, vintage cream, and new leaf, as well as Bazzill lavender. The tag die is the MFT Die-Namics "Vertical Frame." The roses are from the PTI "Rosie Posie" dies, embossed in purple (the shine doesn't show in the photo). The leaves are from a Sissix die. The sediment is NBUS from the MFT set "Pretty Poppies" heat-embossed in SU dark brown and the dewdrops are from Hero Arts. Because I used several snippets, including a snippet of ribbon, I am taking my tag over to the Playground at Pixie's Snippets Playground to show my mates. 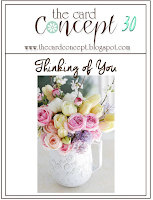 And the current challenge at The Card Concept is "Thinking of You" with a photo of roses! I hope a tag is okay? That question has not been asked in the FAQs, quite possibly because the natural response would be, "It is called the "card" concept, dearie! Off you go!" Still, I'm going to be a rebel and see what happens. It never hurts to try. And, lastly, I am entering a new-to-me challenge called Retro Rubber where the premise is to encourage us to use our older stamps that still need some love! (Actually, I have plenty of NBUS stamps that are over a year old and never been loved at all, she says, ashamed.) For this challenge, Retro Rubber wants us to make a tag or a card with a tag. My "Rosie Posie" and leaves are over a year old. If any of these challenges are new to you, please check them out and play along to show your appreciation for the hard work involved in maintaining a challenge! The challenge links will provide you with details on rules, sponsors, and prizes. Marybeth, thank you for your friendship and encouragement and for using my beautiful birthday card as your "Tag You're It" feature photo!! It is a pleasure and an honor to support you in TYI and add you to my DJKASE tab of card artists! I put a circle (upper left) where the nest is in the small tree behind. It is right outside my Playhouse window! It's up too high for me to see inside, but I'm okay with seeing it all! After I posted this, I realized that in the picture above I captured the little mama at the feeder, so I made another copy with an additional circle on the right (below) where she is barely visible. You can see she has a straight shot to her source of nutrition. The reason I wanted to share especially for this post is because Marybeth also loves hummers and I've been jealous of the fact that for years she has enjoyed having hummingbird nests in a miniature tree in a pot right next to the diving board of their pool! The wee birds are unperturbed by all the activity and the adults and kids using the pool can look right down in the nest! So, look, Marybeth, we have a nest, too! I'll keep you posted and share more photos. I have my ginfers crossed that the babies make it! Such a cheerful rebellious tag! That Kraft paired with that bright purple looks lovely! And lucky you to have a hummingbird so close to your crafty space! I'm sure she'll keep you inspired! That is one great Cased tag! Love the colours with the kraft! You are so lucky to have the hummingbird nest. I have never seen one! The grandkids got a feeder this year so hopefully I will see some of the birds this summer. Oh my goodness--a hummer nest?!! I'd be in heaven! Can't wait to see more pictures, Darnell! 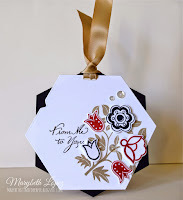 Your tag is stunning-a wonderful case of a Marybeth masterpiece! Oh, humming birds and oleander, you make me so jealous! I suppose you'd be just as jealous of the daffodils and crocuses I can see right now. I love your tag, and thanks (I think) for letting me know about another great challenge, and another couple of blogs to follow. If my Bloglovin feed goes into meltdown, I'll know who to blame! You are so lucky to have the birdie so close... ADORE your Card Concept lovely Darnell, !!! Have the best day!!!! Wow Darnell this is stunning love your take on the TAG you're it challenge and wow what about that bird it's awesome to have it that close, enjoy. Thanks for joining TAG you're it. What a fabulous tag - a worthy tribute to the original!! A beautiful tag Darnell with stunning colours. Your tag is just LUSH, Darnell and Congratulations on your imminent hummerhood! How lovely that you will have humming babies. How exciting to have a humming bird nest right in front of the Playhouse! I am sure you will give us regular reports! Fabulous tag! Love the color combo! Love the purple on your lovely tag Darnell - it really POPS! and what lovely tribute to Marybeth - I just love her work as well!! Thanks SO much for sharing your pics of your hummingbird - how totally awesome that they have a nest right by your stamping cottage!! my cousins have hummingbirds come to their summer cottage in NH - but I have not been able to find a good spot for a hummingbird feeder around my yard and have never seen one in my yard despite planting red plant supposed to attract them - maybe some day! Wonderful tag Darnell, and even more wonderful to have nesting hummers! How lovely. What a gorgeous tag, Darnell! I love the bright, bold purple against the white and kraft, and your leaves dangling over the edge. Enjoy your hummers, wish I had some too! I've only ever once seen one in my garden. Very pretty tag! I love the green and purple together! Not a purple fan here! Love that you have a hummingbird nesting in your back yard! How cool!! My sister in law catches them and bands them and measures them in BC. I love MaryBeth's cards and tags too! Your tag is beautiful! I enjoyed seeing your hummingbird photos - how cool that you have a nest right outside your playhouse! We put a feeder out here at the new house last summer and got to see them a lot - so fun! I love your tag, Darnell! The colors and all your little snippets are beautiful! How fun is it for you to have a hummingbird nest right outside your playhouse! We have a feeder but we haven't put it up at our new house yet. Your card is gorgeous and made me say "SQUEEE!" but all that pales in comparison to the hummer! And the hummer nest! Woo hoo!!! Oh my gosh Darnell, thank you for so many kind words. Love your take on the card I made for you and the color you used is amazing! I am so happy you have a nest!!!!!! Yay! Funny thing is I took the camera out Monday and tried to find a new nest in the lime tree! We can’t go near the tree without being sh-ooshed way by the parents. I know you will enjoy every single day and be sad when the little ones leave. Thanks you aging, and for playing along! Your tag is stunning. Love the colors you used, it's gorgeous. Lucky you to have received the inspiration card. We have hummers that nest in our almond tree...have never had eggs, though. Clearly, you're doing something right. Oh my, Darnell! How did you ever spot that sweet hummingbird nest? Your tag is just stunning and a beautiful CASE of Marybeth's awesome art! That hummingbird nest just stole the show. I'm a birder and I'd just love to see this in person. Thanks for the beautiful close up shots! And yes... your tag.. LOL! Gosh you know I love purple so this is heavenly to me! Lovely, Lovely Tag, Darnell!! Sorry I haven't been by as of late, but I've been by and taking peeks of everything :) Just Fabulous creations! So Fun!! Love your stunning tag, Darnell!!! Those roses are lovely!!! Great use of the colours!!!! And your hummingbird is so sweet!!!! The boys and hubby are very keen birders - will show them your photo's. TFS. oh what a very lovely tag. great colour rose, and beautifully designed too. How wonderful the pics of your humming bird. Lots of crafty love. Jenny L.
Your DJKASE of Marybeth's tag is fabulous and I see that Marybeth was very pleased with it herself! Well done you! I, too, belong to the Marybeth fan club! Your beautiful tag is a wonderful tribute! I'm so glad you have a hummingbird nest, and just outside the playhouse! Hi Darnell, beautiful tag, image and colours are gorgeous. Beautiful, I need to pull out that flower set... thanks for the inspiration and many thanks for joining us at Tag You're It Challenge. Beautiful KASE of Marybeth's tag, Darnell. Thanks for sharing the hummer pictures. Some day. . . .
Beautiful tag, Darnell!! I love PTI's Rosy Posy set. I love when one tag (card) works for so many challenges, too! Very well done! Gorgeous tag and love the colour. Fab photo's, love real birds. Loved reading about your card and your friendship..... I really like your colour choices! And the humming bird story is priceless---- hope you get babies!!!! Gorgeous case, Darnell! Enjoy those little birds. Hummingbirds choose only good people, so it does not surprise me that they have set up a nest at your home. I look forward to more pictures, I hope that avian family will really large and happy. YOur tag is beautiful! I bet Mary Beth just loves it! I just love those roses and the colors on the khaki! You are so lucky to have the hummy nest! I hope the little ones make it! And PLEASE keep us posted with photos! We don't get hummies here in NC until April or May! I always have a feeder or two hanging all summer long! LOVE your gorgeous tag, Darnell, and the inspiration from Marybeth! :) Have fun watching the hummers! A wonderful CASE of Marybeth's tag! She is a treasure! Hope your hummer's babies survive. How exciting! I saw a video on Facebook a week or so ago of a guy holding a lid with "nectar" in his lap and the hummer came right up and ate (drank?) out of it. It was the most amazing video and I was mesmerized! They are so pretty! Your tag is so beautiful, Darnell! Also, thank you for sharing pics of your resident hummingbirds with all of us. How exciting that you will soon have baby hummers chirping for their noonday meal from mama hummer. Hope you'll continue to share their story. Gorgeous tag - love the flowers and way to make purple shine :) ADORE the photo of the hummer in the next - meeep!! We have hummers here and our neighbours actually have a nest in a box frame in their house but I have never seen one. Love it!! Hope you get some photos of the babies!!! Don't you just love Marybeth!! This is such a pretty tag, I can smell those roses now. LOVE the hummingbird photos and how fun to have the nest right outside the playhouse! Your tag is just gorgeous Darnell I love that shade of purple. 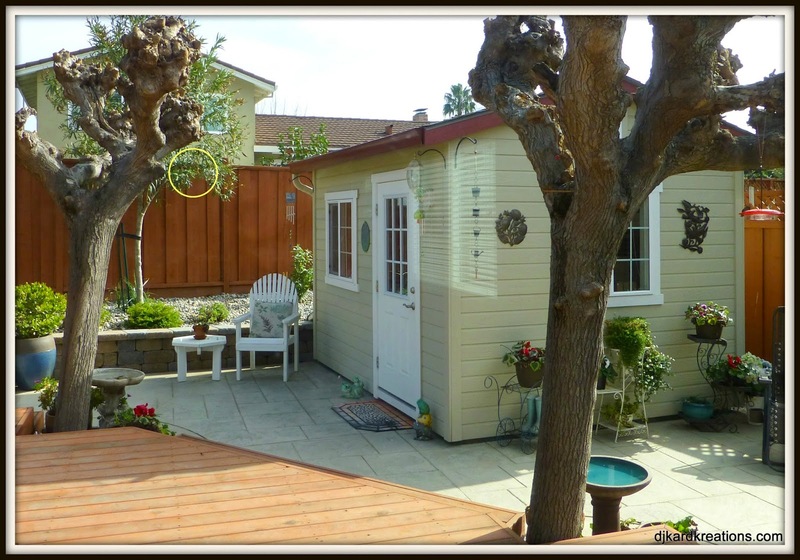 Thank you for sharing the photos of your gorgeous spring yard. The hummingbird has nested there to watch you playing in the playroom. How lovely. Thank you for sharing with us at Tag You're It! What a great treat to see out your window Darnell! Wow great tag Darnell! You CASed Marybeth perfectly! the colors you chose too are beautiful and so elegant. Darnell your tag is stunning!! 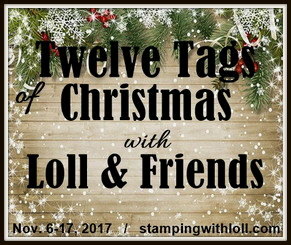 I have to agree that your friend's card and tag are stunning too! And what a treat to have that bird nesting right in front of your playhouse!! I'm so envious! Thanks so much for sharing those fabulous photos!! Gorgeous tag Darnell! Love the rich colours that you created with and that Kraft base is the perfect background to showcase the vibrant blooms with matching twine and ribbon, such a beauty! Awesome tag - the purple flowers are gorgeous! Love how the sprig of leaves overhangs the tag! And no worries - tags are A-OK at CCC! FABULOUS pics! Can hardly wait for updates! BTW - did you ever name the new fella? If you told us, then I've forgotten so please refresh my lapsing memory! Love that kraft tag, I usually reserve kraft for man cards, but wow, this looks fabulous! Thanks for showing a girly kraft hon! Your tag is absolutely gorgeous and so glad you shared about the hummingbirds! Oh Darnell - FANTASTIC tag but even more FANTASTIC about the hummingbird nest!!! ( I GET it! Grin) Ihave never experienced a nesting humming bird, but one of my "highlight" memories is coming upon a male hummingbird doing his mating dance for a female, He does multiple figure "8"'s while she remains perfectly still (hovering in the air) watching him.... It took a second for me to realize what I had stumbled onto, and good thing it was ONLY a second as, with all things Hummingbird, it did not last very long! Grin Thanks for making my day!! Your tag is vibrant and vivacious...totally royal. Gorgeous! The hummers found a good home where they are appreciated and admired. 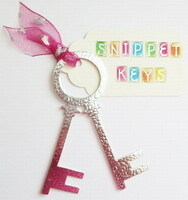 Gorgeous tags! The colors are so vibrant and really stand out on the kraft paper! Simply stunning! A lovely tag but what I truly enjoyed was your hummingbird update! I love them also and have never found a nest in my yard but have known there was one close by. They are so much fun to watch especially in late summer when the fledlings are busy spreading their wings. I do hope you will come back often to play along with RRBC. I certainly enjoyed your visit!! Amazing card with a great story to match! Hummingbirds are so delicate, thank you for sharing their story with us as well. Glad you stopped by to share your creation with us at Retro Rubber Challenge Blog, please come again! Plus is is a great place to use your NBUS stamps! Love your tag...just love it! So pretty and I love your sweet photos too, so beautiful. Enjoy the warm weather and see you soon. How fun Darnell to be able to watch the little hummingbird. It will be wonderful when the babies hatch. It is a little to early here in the Pacific Northwest for birds to be laying eggs. Your tag design is fabulous. Love this gorgeous tag! It's such a wonderful interpretation of Marybeth's design. Oh, and finding your hummingbird nest is so exciting! You're going to have such fun watching the little family. Hope we will see more pictures!! So great to see the hummingbirdnest in your garden! Enjoy all you can see! Your tag is stunningly fresh and I like the roses! Really think this is so lovely! Thanks for doing the challenge! I don't know what is more beautiful, the tag or the hummingbird! :-) Thanks for playing with us at the Retro Rubber Challenge Blog! Hi Darnell! Thank you for finding Retro Rubber and playing along with us! I love your tag! I want to reach out and touch those roses! Beautiful! Your comment on NBUS is so true I have the same problem and never seem to get in on your challenge! Next time I hope! Thank you for your kind comment about supporting the challenge! We are having fun! I noticed this right away over at The Card Concept! So bright and beautiful! I love hummingbirds, they are so fun to watch! Those purple roses look LUSCIOUS with the shiny embossing! Simply beautiful. Gorgeous tag Honey. But the star of today is Mrs Hummer! So exciting to have her so close to you. I look forward to reading up the latest news. Do let us know when the Happy Day arrives. A gorgeous tag and wonderful colours! LOVE it! What a great place to have a nest! I would be too busy watching to get things done, lol! 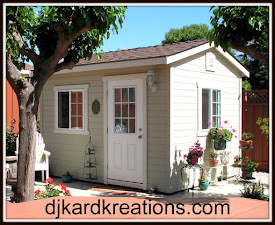 Love your playhouse too! Gorgeous case of Marybeth's tag, my friend. Vivid purple..love! As for your hummmingbirds...oh my! Exciting and just so incredibly special. We don't have them here; if they did, they'd be frozen little hummers for sure! I'm glad you'll keep us posted on egg-hatching progress! What a lovely CASE of Marbeth's card. I am LOVING the colors you chose to use. I am in love with purple and greens together as of late!!! If you hadn't commented on my tag, I probably wouldn't have known I had been picked as a Favorite! I didn't scroll down far enough in the blog post. Thank you for visiting my blog/tag ...and congratulations to you, as well. This is fabulous - the colors perfect, the flowers lovely and just all in all an awesome tag!! Love the enthusiasm with which you shared your DJKASE - truly inspiring and so fun!! !